Nate Silver @ FiveThirtySeven …who is longwinded…..breaks it down to this….. Also…..He feels ( I agree with him ) that Rubio will immediately track to the middle…..trying keep his right support with him ..thus cementing a win against Meek…. Charlie Crist has everyone waiting……..
Until he lets the world know if he’s stay with the party and presumably drop his bid for the Senate and run for the office he has…..Governor of Florida……. Decides to throw the dice and run as an Independent for the Senate…. If he chooses to run as an independent, Mr. Crist would be betting that the prevailing political logic of the moment is wrong — that despite the Tea Party’s rise, the broader electorate still wants the pragmatic approach that propelled Barack Obama to victory here. Leading a campaign that would most likely lack major fund-raising and a party’s street-level support, Mr. Crist would be running in the hope of turning out “the silent majority” thatRichard M. Nixon identified in 1969. Experts say the governor’s odds are long, but not impossible. “There is a huge gap between the leadership, at both the elite and grass-roots level, and your mainstream Republican voter in this state,” said Daniel A. Smith, director of the political campaigning program at the University of Florida. Mr. Crist has only hinted at his intentions. He has until April 30 to decide, and some of his closest confidants — including his former campaign manager, George LeMieux, whom Mr. Crist appointed to the Senate when Mel Martinez retired — say he has not tipped his hand. Many Republican officials at the county level describe the governor as hunkered down. But a trickle of clues have made a Crist run with no party affiliation look more likely. Daniel……Florida Senate; BREAKING NEWS: Republican Leadership writing of Crist; Believe he’ll run as Independent…. I know, I know the Polling News is interesting BUT before we come to that we’ve a potentially MAJOR DEVELOPING STORY regarding the Republican Senate Primary in Florida. Sources telling Hotline On Call that the “Republican Leadership” looks like they have OFFICIALLY written of Florida Governor Charlie Crist (R-FL). Top Officials in Washington D. C. now believe it’s VIRTUALLY a CERTAIN THING that Crist will bolt Republicans and run as Independent. 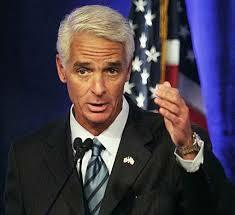 Privately, GOP officials have even tried to broach the idea that Crist drop out of the race. NRSC chair John Cornyn called Crist on Friday, intending to make it clear that Crist should drop out if he doesn’t believe he can win a party primary. Crist did not answer the phone, a source close to Cornyn said, and as of today Cornyn’s call hasn’t been returned. Party leaders spent the weekend sending more overt warnings. Cornyn told Politico last week Crist would be ending his GOP career by running as an independent, while Senate Min. Leader Mitch McConnell told CNN Crist would lose party backing if he leaves. Instead of from party leaders, insiders believe Crist is getting advice from Sen. George LeMieux (R), the man Crist hopes to replace. LeMieux ran Crist’s ’06 GOV race and has served as his top aide in the past. LeMieux has denied he knows anything about a potential party switch. During a conference call with reporters last week, LeMieux told Hotline OnCall he expected Crist to run as a GOPer, comments he echoed this morning. Crist has yet to ask his staff whether they would stay on if he runs as an independent, but several top advisors have already told party sources they would sever ties. GOP ad expert Stuart Stevens, of The Stevens and Schriefer Group, would leave the campaign, and party officials say they believe most senior staff would exit too. Crist’s pollster, Glen Bolger, is also expected to leave, though he would not comment for this story. Bolger already lost one client this year — Sen. Arlen Specter (D-PA) — after a party switch. As GOP leaders have replaced idle gossip that Crist may switch parties with near certainty that a public announcement is imminent, the party has sought to illustrate the severity of the consequences. The once-popular FL gov. is walking a tightrope as he considers whether to run on his own, whether to drop out or whether to plod along in his bid against Rubio. If he runs as an independent, angry donors could ask for their money back, and Crist might not be able to find the financial resources to replace it. And with no party apparatus to rely on, Crist’s organizational options would be seriously limited. A successful FL campaign relies on an early voting strategy, and without the FL GOP executing that strategy on his behalf, Crist would face a serious organizational deficit. The most CLEAR INDICATION Hotline mentions ARE Crist’s TV-Ads worth 1,5 Mio $ aimed at Rubio to move Poll Numbers. 1. I’m not sold just yet on an Indie Bid by Crist. 2. By pulling his TV-Ads it could also mean that he could drop out of the Race altogether. Daniel…on this….. I agree with ya…..lets wait for a few days……. Daniel……Florida Senate; BREAKING NEWS: Republican Leadership writing of Crist; Believe he'll run as Independent….